Every summer my goal is to find books for my reading list. Nothing beats leisurely summer reading. 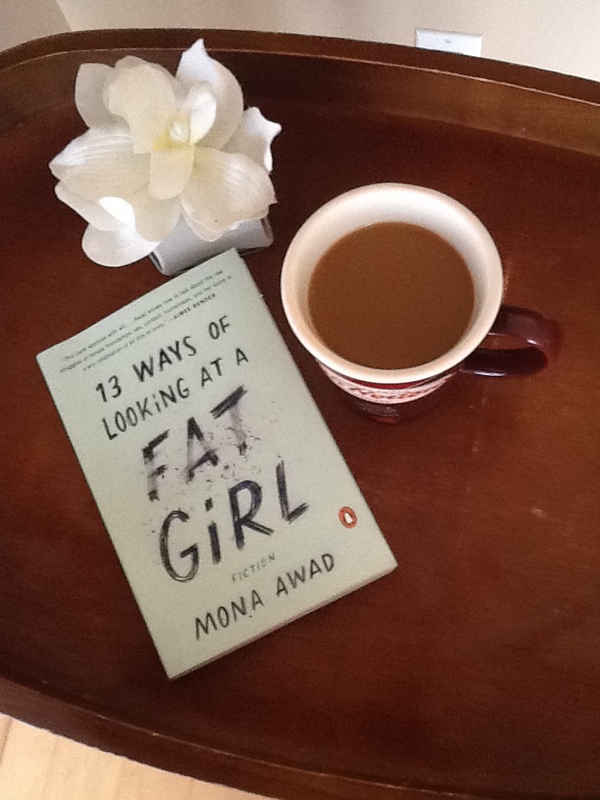 I found the book 13 Ways of Looking at a Fat Girl, written by Mona Awad on the Apple book list of recommended readings. The book was a pretty quick and easy read. Set in the city of Mississauga (west of Toronto), we are introduced to main character, Elizabeth (AKA Lizzie) an over-weight teenager. Lizzie is encouraged by her best friend Mel to meet boys, use her sexuality and get out in the dating world. Lizzie does not feel as comfortable and sexually forward as Mel. Lizzie feels insecure about her weight and struggles with poor body image issues. In her coming of age, we experience Lizzie settling for men who use her and take her for granted. We find Lizzie constantly waiting by the phone for them to call and must undergo the painstaking and exhausting task of stroking the ego of these men in hopes that they will stick around for the long haul. Lizzie is also no stranger to meeting deadbeats over the Internet, and is often hesitant to send these online suitors a full body photo in fear of rejection. Fast forward to Lizzie’s adulthood. Now going by the name Beth, the main character wants to bury her past of Lizzie as she has finally lost the weight and has gone through a complete metamorphosis. Is she happy now? This is where I find the book sad. The new person Beth is married and seems to lead a miserable existence, for both herself and her husband. Now her painstaking task is constantly measuring out food, calorie counting and refusing indulgent food on special occasions that she truly desires. Beth even goes as far as bringing a dry looking veggie burger in a ziplock bag to a BBQ, in hopes that the host will put it on the grill. Squeezing her body into clothes that are too small, Beth still has not lost her inner fat girl, as her former self Lizzie refuses to be buried. These insecurities, her mood swings, intense guilt when has a gluttonous slip up in her diet and the haunting of Lizzie who lives on internally will eventually lead to her husband seeking a divorce. Her husband met Beth when she was fat, and found their relationship much more fullfilling when Beth was overweigt and he cannot understand her obsession to be thin and misses the old Beth he once knew. What really resonated with me is Beth’s manicurist, a character named Cassie. She had a small part in the novel, but a big message to me. Beth is regularly going to get her nails done to fill another void in her life. (This and chronic clothes shopping for fancy, over-priced dresses.) Cassie is very over weight. But what Beth cannot fathom is that she is genuinely happy. Cassie eats cakes, pasta, cookies and the like. She dines with her husband at restaurants on fat-laden foods. Cassie has no desire to spend her time endlessly sweating on an elliptical, or measuring quinoa in a container. She enjoys her life, and focuses on the things that bring her joy, dining out, her marriage, movies, etc. Is Cassie unheatlhy and out of shape? Could be, but one thing is for sure. She is in fantastic mental shape. Not all fat people are miserable, just as being slim does not bring guaranteed happiness. Happiness has to come from within a joyful heart and positive mindset, not a number on a scale or having a six-pack. As I mentioned though, Beth’s prison of extreme dieting but looking through cookbooks at decadent desserts she feels she can never eat, I found a tad depressing. The book was a bit too sexually charged for my taste, but it is a coming of age tale of a teenage girl. The fat girl waiting by the phone for a man who mistreats her was too stereotypical for me. I know there are plenty overweight girls who wait for no phone call to live their lives. The book did have some heart-warming moments, like the relationship with her mother, and Beth growing closer to her absent father after her mother’s passing. There were also some humourous moments too with Beth’s interactions with friends and co-workers as she struggles to maintain her goal weight. Over all, I found this book a good read. Whoa! I’ve never heard of this read! LOL Interesting summary though!! It was an eye opening book at times. Interesting book and different from what I expected. Wow, that book sounds fascinating! I’ve often thought about this same thing….how much of a sacrifice are you willing to make to be thin??? AND, there’s way more to life than constantly obsessing over food, exercise and the like. What a cool book. I haven’t read for a long time and I MISS it!!!! This book sounds like one I’d love to read! That’s exactly what I thought. She had the workouts and diet down pat, but never seemed happy or that she could shake “Lizzie.” She made a lot of sacrifices, but it kind of seemed pointless at times. You could probably find it on Amazon. Looks like quite an interesting read about a topic that some people don’t want to discuss for fear they are considered offensive. I started a BookTube channel a few weeks ago and since then, I’ve been meeting lots of other readers and been getting some great book recommendations. My TBR list has grown exponentially. Yes, it’s a pretty sensitive topic, but the author delves right in. I am definitely going to look at that link. Thanks for sharing Karen. Hi Charlotte. This was a great book review! Aww, I almost picked it up when you said “sexually charged”. Lol. However, it seems depressing overall. I’m going to look for the ending online. Sounds interesting though and worth the read. Yea, definitely some sexual cringe moments for me that could have been left out. I’m not a prude, but some things are better left to the imagination. Some chapters were graphic, but I think this demonstrated Lizzie’s need for love and acceptance. Also, I see why Cassie stood out to you. Does she mention Cassie being of a different background? My goal is not to stereotype as stereotypes are not factual. I’m not too sure about Cassie’s background. She seemed to be a middle aged lady, but not sure of ethnicity. Oh! If it was intricate to the plot I’m sure Mona would had mentioned it. It is a good review. Thank you. Thanks for reading, Vonnie. I truly love and appreciate your input. Thank you for the excellent review. I can relate to the parts about still seeing & feeling as the fat you. We think losing weight is going to make life wonderful but if the inside of your mind has not changed, you are still that fat girl. I so get that!!! Thanks for reading. Glad you enjoyed. I think this book had elements many can relate to. I know all about that “if I only lose ten more pounds, I’ll be happy” mentality. I don’t miss that way of thinking in the least. You’re a very busy beaver! Hopefully when your schedule allows you can relax with a good book.